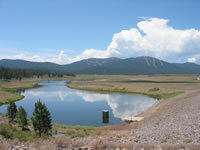 See the Martis Creek Lake website for additional information. Primary recreational opportunities are listed below. Factoid: Located close to Lake Tahoe, Truckee and Reno, Martis has a beautiful, peaceful campground off the beaten path. The Martis Creek area features hiking, biking, canoeing/kayaking and trout fishing.